Is your Tripawd bored of the same ol’ Tripawds bandanna? Fear not, the latest three-legged apparel is finally here! 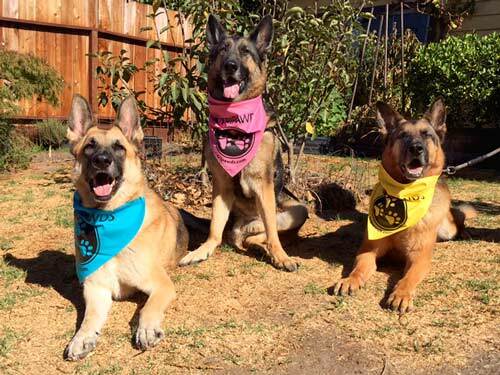 The Oaktown Pack models the latest Tripawd Bandannas. Fly Your Tripawd Bandanna with Pride! The first Tripawds logo was created with our hero Spirit Jerry in mind. And as much as we always loved that sweet front-legged doggy Tripawd design, the times they were a-changing (for the better!). 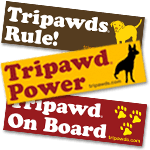 Many Tripawd kitties have joined the community since we began in 2006, so earlier this year Admin Guy introduced the Tripawds Badge of Honor, the new Tripawds logo. New t-shirts, gifts and apparel with our new badge of pride made it into the Tripawds Cafe Press Store earlier this year. 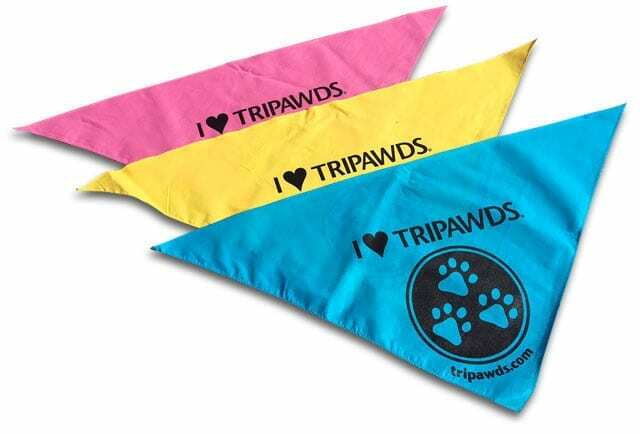 And now, we’re pleased to announce the new Tripawds Badge of Honor Bandannas! They’re just as colorful as ever. Sized for medium to large dogs, they’re a wee too large for smaller Tripawd heroes to use as bandannas, but they make great superhero capes! The best part about the Tripawd bandannas? They’re still a “Pay What You Can” item! 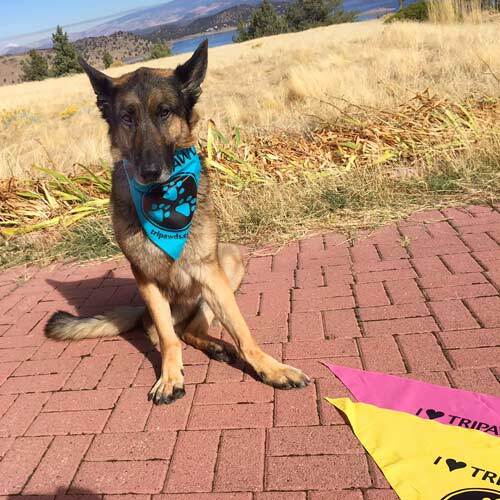 Get Your Tripawds Bandanna and Fashion Statement Here! Because we know that Tripawd parents have extraordinary vet bills, we aim to make it easy for every amputee dog or cat to fly their Tripawd pride without undue hardship. 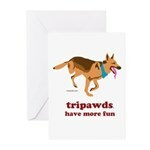 So just click the Support Tripawds button below and pay whatever you can afford right now! 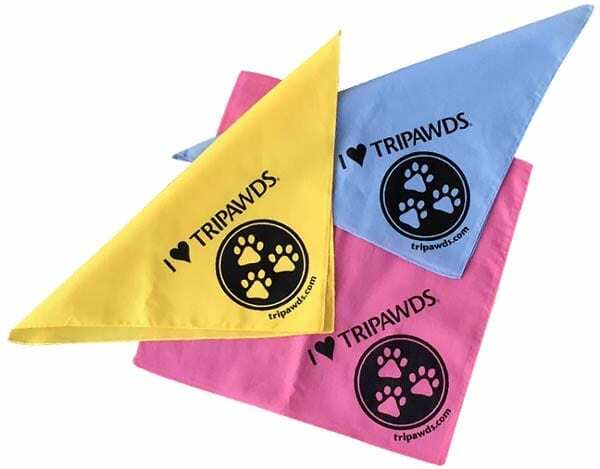 Click the desired Support Tripawds button below to name your price and get your Tripawds bandana! in the Comments field upon checkout or we will pick a color for you. Perfect for three legged dogs of any size! 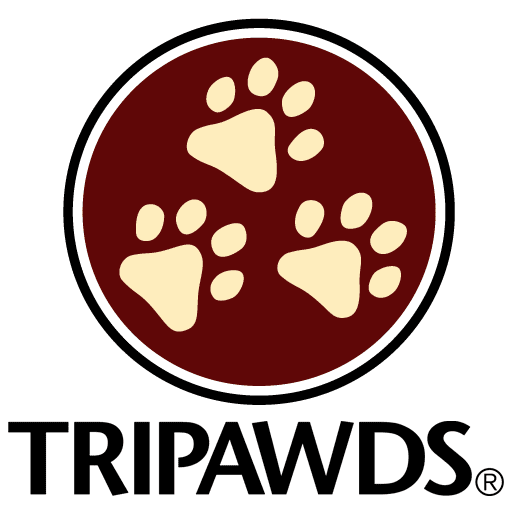 Click the Support Tripawds button to donate securely via Paypal. Be sure to indicate your preferred color and include your shipping address. Perfect for small breeds and three legged cats! Click the Support Tripawds button to donate securely via Paypal. Be sure to indicate your preferred color and include your shipping address. NOTE: Recommended contribution is just $12 in the U.S. (add $5 for international addresses) to cover production and shipping costs. Please see original Tripawds Bandanna Announcement for details. I love it. 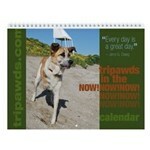 What a great way to embrace our Tripawd kitties and how this community has grown! Ordering one for Frankie right now!! Can’t decide between the bue or yellow though! Ohhh my…decisions, decisions!! Just may have to get two!! Michelle…great idea about taking some to Vet’s office! OAKTOWN PACK!! YOU ARE EXCELLENT MODELS!! Sittin’ real pretty!!! LOVE LOVE LOVE the new logo…i can’t wait until my maw gets me a bandana with the new logo…she said she needs herself one of them shirts also! No problem Lynn! You do not need a Paypal account. Upon checkout at paypal.com you have the option to use a credit card instead. And, you can call during business hours or feel free to mail a check. Just know that mail forwarding may take up to three weeks to reach us. Find contact details here.